on the 25th Jan. 1942 with her 9 month old son, Charles Antony Bennett Groves. The Burmese believe that if a Tokay gecko, a ‘Tucktoo’, appears in the room at your birth, you will always have good luck. That ‘good luck’ my Mother and I both experienced was later to prove a blessing! The Burmese call the Tucktoo a Taukteh. The large lizard makes a stuttering crescendo sound of took, took, took, when announcing themselves and then Took-Eh, Took-Eh, Took-Eh, for anything up to a dozen times in a slow decrescendo. 23rd December 1942. General Michio Sugawara bombed Rangoon and the Mingaladon Airfield. The Shwedagon Pagoda acted as an excellent navigation mark from the air. 16th January 1942. Japanese battalion occupies the southern tip of Burma, giving them their first airfield inside Burma. 25th January 1942. My Mother and I evacuate from Rangoon. 8th March 1942. The Japanese marched into an empty Rangoon. My Father, Robert Bennett Groves, known as Bob, began his career in Steel Brothers working in their Insurance Department in their London office and came out to Rangoon a few months later. Burma was rich in natural resources such as oil, rubber and minerals and also rice. Steel Brothers was responsible for the management and development of these enterprises. My Father, Robert Bennett Groves, known as Bob, began his career in Steel Brothers working in their Insurance Department in their London office and came out to Rangoon a few months later. Burma was rich in natural resources such as oil, rubber and minerals and also rice. Steel Brothers was responsible for the management and development of these enterprises. ‘The balloon went up on Christmas Day 1941 when the Japs began to bomb Rangoon two days earlier. “Bob belonged to the local army and naturally went and put on his uniform and vanished to their headquarters. He was also in demand by the Government of Burma and when he joined the local army, all hell was let loose. The phone rang and I was told he must get out of the army as he was urgently needed. What was I to do? I found him and spoke to him behind bars - they were all fenced in. Eventually the Government of Burma won and he was released and became a Government servant for the duration of the war, running the war risks insurance. Bob was told to take some of his clerks and escape. There were two ways to trek out of Burma. The natives went one way and the Europeans went another. What he went through was hell and he would never talk about his journey to Calcutta through the infamous ‘Valley of Death’. He later said that he could always recognize someone in any bar in Britain that had been through the same experience of that journey. With his fellow evacuees, they came across a bombed convoy of army trucks which had been abandoned only to find one that still worked. They were able to travel on it for a few miles and widen the distance between them and the advancing Japanese. They then had to walk. As he had hammered toes and wore size 13 shoes, walking down the hills was very painful. Those who survived this fierce fighting faced malaria, air attacks, lack of food and water on the long walk out to India. where I was also conceived. Ragged groups of soldiers and civilians were forced to trek out of Burma through some of the most inhospitable terrain in the world. They hacked their way through jungle, forded rivers, and climbed steep mountainsides to escape. Many did not survive the journey. Many, who had enjoyed an idyllic colonial lifestyle, were ill-equipped for the journey. Setting off with their family silver and their pets, they soon had to abandon all but the essentials in order to survive. Thousands died, but many more crossed the border into India and safety. Bob and many of his friends took several bottles of whisky to avoid contracting malaria. Sadly, one of them got the first signs of the disease and they told him to drink as much whisky as possible to kill the bug. He was tee-total and only drank a few sips and died a few days later. Before Bob died, Charles begged his Father to tell him what he had been through, but he refused and began to cry. It was too painful so Charles stopped immediately. We had a shelter dug in the bottom of the garden where Nanny, Charles, Bob and I went to but after the all clear Bob & I went back to bed leaving Nanny and Charles there undisturbed. We only had a few Americans to protect us in the air. Charles was 9 months old and he & I had offers to go up country but I refused and felt I could be more useful at home. Thankfully, he loved the sound of the exploding bombs and wasn’t afraid. I did a full time job deciphering cables with two others and not a minute elapsed between our shifts. I also spent hours at Government House cutting out pyjamas etc. for the wounded. I had a dress making certificate so I knew what I was doing and not to waste material. One day Bob came back from the office and said we were to sail that night. I had a few hours to collect myself. We thought we were going to Calcutta to be met by Steel Brothers and sent on to Rawalpindi where Steels had an office in the oil fields. We did not sail that night and I had said I wish I could take my sewing machine and golf clubs. Bob materialised with both the next morning and we found out we were sailing to Madras as it was easier to manoeuvre troops – what to do? Bob wired Bombay where he thought we would be offered hospitality. We abandoned our home at 62A Golden Valley in Rangoon with all our possessions and left Burma as quickly as we could. Fri 12th Dec 1941 Small Japanese units began the ground offensive by infiltrating into Burma. Tues 23rd Dec 1941 Japs bomb Rangoon; docks damaged and authorities had great difficulty in getting the port to function. Sat 24th Jan 1942 Japs made two air attacks on Rangoon during which we shot down 15 fighters, 4 bombers, and lost 2. Sun 25th Jan 1942 980 troops evacuated on board the SS Takliwa from Rangoon with 2 women & 1 child. Sat 7th Feb 1942 24 Japanese fighters bombed Rangoon, 2 shot down, 4 probable, 1 damaged. 2 Mingaladon Airport runways out of action after 4 bomb attacks; 2 ground aircraft destroyed. Thurs 12th Feb 1942 Japaneseadvanced and after heavy fighting on the southern front occupied Martaban by landing seaward. 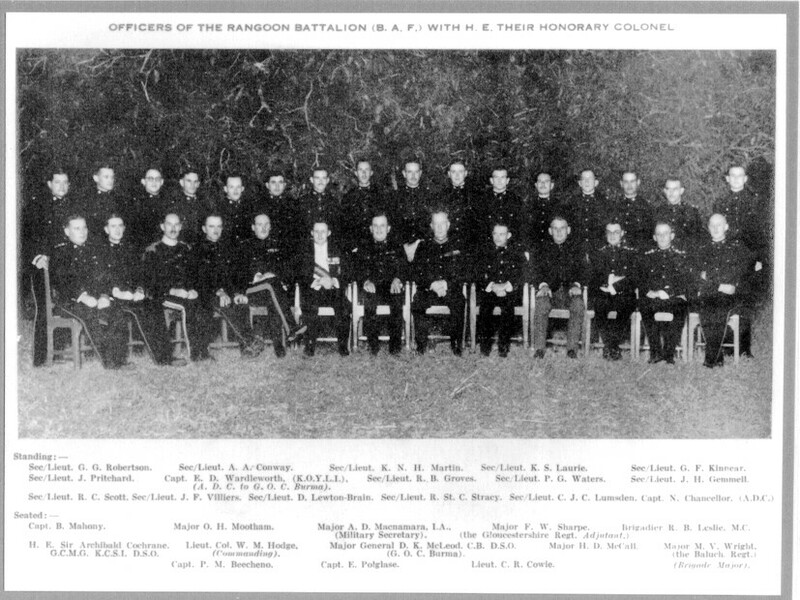 Sun 8th March 1942 Rangoon falls to the Japanese. When we stopped at stations, I got out and bought food - curry for Nanny, anything for me and something with gravy for Charles as I did not want him to have an upset tummy. The train rattled so much I put Charles back onto a bottle so as not to spill it. Eventually someone realised what I had been through and offered advice. We stayed in the Mafatlal Park. I then met someone who got me a job with the Red Cross. I travelled in by bus. When Bob got out to Calcutta, he phoned the Golf Club and luckily I was there to answer it. He had walked out of Burma and would never talk about his experiences. S.S.Takliwa was built by Barclay, Curle & Co Ltd, Glasgow for the British India Steam Navigation Co Ltd.
She had 1st class accommodation for 56, 2nd class for 80 and 3,302 deck class passengers. In 1942 she was at Bombay when WW2 started and was requisitioned by the Ministry of War Transport for use as a troopship.